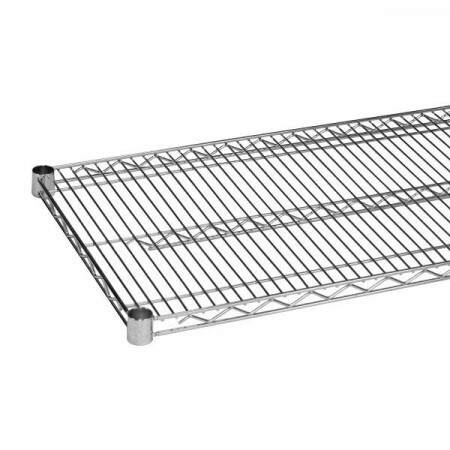 $22.99 Royal ROY S 1448 Z Polycoated Zinc Wire Shelf 14" x 48"
$44.99 Advance Tabco EG-1448 Green Epoxy Coated Wire Shelf 14" x 48"
$46.19 Winco VC-1448 Chrome Plated Wire Shelf 14" x 48"
$21.71 Winco VEX-1448 Epoxy Coated Wire Shelf 14" x 48"
A great addition to any home, restaurant, or food service establishment, the Thunder Group CMSV1448 Chrome Wire Shelving 14" x 48" is perfect for storing food supplies, and other kitchen necessities. This stylish wire shelf is constructed from heavy duty chrome-plated metal which is rust resistant and exceptionally durable. For convenience and easy installation, this NSF listed piece includes four plastic clips.